Tell us about the last experience you had that left you feeling fresh, energized, and rejuvenated. What was it that had such a positive effect on you? I changed out a light switch today! I realize that’s not exactly rocket surgery or brain science. It’s nowhere near as awesome as Kate and her Fence Repair (click here to see her adventure). Still, I probably would have paid an electrician a hundred bucks to do what took me five minutes. I did a search on YouTube for “how to change a dimmer switch,” listened and watched the nice couple demonstrate, then got to it. I shut the electric to that area of the house, matched the wires, and voila! Admittedly, my husband helped me with the screws, but that was after I had connected all the wires. I know my dad is proud, especially since I didn’t electrocute myself or cause any fires (he’s a retired firefighter). 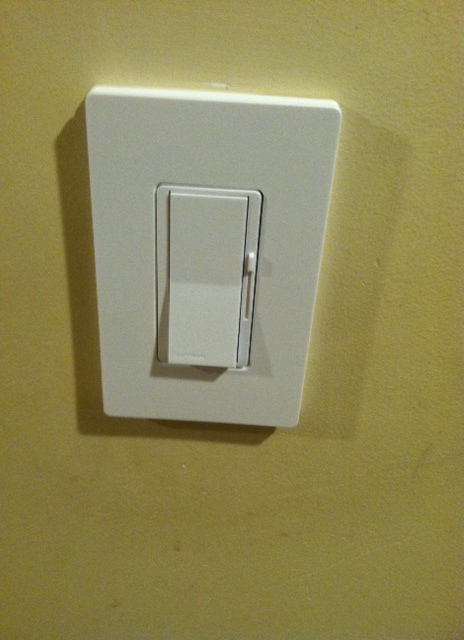 I was so happy to flip that switch and see light! It definitely put a spring in my step. The prompt asked why the event had such a positive effect. I think, for me, the positivity came from the fact that I wasn’t expecting it to work. Had someone offered a wager before I flipped that switch whether or not the light would turn on, I’d have bet against myself. I didn’t believe that I could successfully do something so outside of my usual. Well, hooray for me because I would have lost that bet! I’m now looking around the house for my next “home improvement” project. Maybe I’ll replace my back porch. Okay, that’s a big jump from replacing a light switch, and I’m not Bob the Builder or Tim “The Toolman” Taylor. Or the amazing Kate from Did That Just Happen blog. Thanks, but no thanks, Bob! I’ll handle it from here. However, I’m guessing I could YouTube “how to do” just about anything, and find a video on it. If the directions are good and I have the muscle power, maybe a couple of tools, the possibilities are endless! Have a nice, well-lit night. Haha! You (and Bob) are my heroes! Thanks for the re blog too! You inspire Kate!! You inspired Jess and you inspire me and you inspire so many of out here. I agree! Kate’s the best! Awesome!!! Glad Kate reblogged so I could see this. You are an inspiration to all. My husband is completely retarded when it comes to any sort of home improvement, I don’t even allow him to have tools, but I’m almost as bad… So we pay out the nose for people to fix our house. Next time, I do it myself! Yes, I highly recomment YouTube and then trying yourself! Good luck!